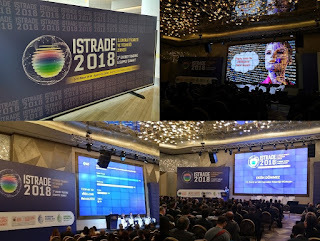 Barely had the Oilholic returned from Panama, that it was time to head 1550 miles east to Istanbul, Turkey for ISTrade 2018: The 3rd Energy Trading and Supply Conference on the banks of the Bosphorus. Yours truly was invited to speak and moderate a panel on the digitisation of energy trading here with a heavy emphasis on - you guessed it blockchain; an emerging and perennially hot topic at energy trading events which are rapidly beginning to feel like technology events! More on that later, but first on to 'crude' thoughts, and it seems feedback from the great and good of energy trading in Turkey, on this splash and dash work visit to the country, reconfirms one's thoughts that oil is likely to stay in relatively predictable price bracket of $60-70 per barrel, even if geopolitical risk briefly props it up to $70 per barrel. Away from the crude price, ISTrade 2018 delegates also noted how trading arms of 'Big Oil' companies, and established commodities trading houses like Vitol, Gunvor and Glencore and the likes, are investing in blockchain and are being exceptionally candid about it. It set the scene nicely to discuss energy trading in relation to emerging technology, and the Oilholic's take was that it's a one way street to process efficiencies and optimisation. The market can expect more of the same. To discuss the subject, this blogger was joined on the panel by Ashutosh Shashtri, Director of EnerStrat Consulting and Serkan Sahin, Manager, Europe and Africa Oil and Gas Research at Thomson Reuters. Elsewhere, at IStrade 2018, a plethora of crucial topics were discussed. Here is the Oilholic's detailed report for Forbes from the event. One final point, before taking your leave, is to flag up a Rystad Energy research note that arrived over the weekend. The independent energy research and consulting firm reckons US oilfield services have more to lose compared to Chinese peers from current trade tensions between both countries initially fanned by President Donald Trump. On April 3, the US published a list of approximately 1,300 Chinese exports that could see tariffs in the near future. Not to be outdone, the Chinese government promised and delivered additional retaliation. These potential Chinese tariffs include plastics, petrochemicals, petroleum products and specialty chemicals. "For an oil and gas industry looking to rebound in a higher oil price environment, these tariffs necessitate monitoring. More specifically, oilfield service companies must now take pause," says Matthew Fitzsimmons, Vice President of Oilfield Service Research at Rystad Energy. American companies Clariant, Ecolab, Hexion and NOV each have had significant revenues from China in the past few years. NOV brought in revenues upwards of $561 million during 2017 from their fibreglass and composite tubular businesses in China. "The giant service company NOV was anticipated to have over $650 million in annual revenues from China for the remainder of the Trump presidency. A trade war between the two nations could certainly impact their ability to grow in this market," Fitzsimmons adds. Hexion, a chemistry company offering oilfield drilling chemicals, had $309 million in revenue from China during 2017. Rystad Energy estimates Hexion's Chinese business could grow to $350 million in 2019, if it were not impacted by trade tariffs. Continued Chinese and American trade tensions could have an adverse effect on these companies. While less volume is at stake, the trade tensions also give reason for concern to Chinese service companies. Hilong and Drill Pipe Master are two pipe fabricators that were impacted by initial US tariffs. However, these companies have strong domestic customers and diverse international clients that will soften adverse effects from trade tensions. Well there you have it, although many here in Istanbul are hoping things would calm down between the Trump White House and China, with cooler heads prevailing eventually. That's all from Istanbul folks! Keep reading, keep it 'crude'! © Gaurav Sharma 2018. Photo1: Glimpses of ISrade 2018, April 9-10, Istanbul, Turkey © Gaurav Sharma 2018. Photo 2: The Oilholic speaking at IStrade 2018.